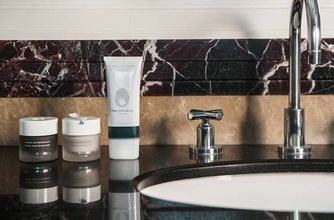 Ideal for all skin types, this delectable product helps clear congestion, combat dryness and soothe sensitivity whilst leaving skin firmer and more luminous thanks to its unique Hydro Mineral Transference system that delivers targeted minerals deep into the skin. Sufficiently gentle for even easily-upset complexions, Omorovicza’s Foaming Cleanser floods skin with moisture whilst helping to draw out impurities and balance sebum production, to encourage your skin to be the best that it can be without shocking it into submission! Omorovicza distils 2,000 years of Hungarian skin care tradition and mix with cutting-edge technological advances in their Nobel Prize winning laboratory, to develop luxurious, nutritive skin care solutions… worthy of the Queen of Hungary herself (as well as mere mortals). Lightly moisten face and squeeze a pearl size amount of this cleanser into the palm of the hand. Lather well and apply to entire face in circular motions, rinse off thoroughly; follow with the appropriate Omorovicza serum and moisturiser. Aqua (Hungarian Thermal Water), Glycerin, Sodium Cocoyl Isethionate, Sorbitol, Disodium Lauryl Sulfosuccinate, Sodium Chloride, Phenoxyethanol, Saccharomyces (Hungarian Thermal Water) Ferment Extract, Limonene, Xanthan Gum, Parfum (Fragrance), Copper Gluconate, Linalool, Ethylhexylglycerin, Disodium EDTA, Pyrus Malus (Apple) Fruit Extract, Phospholipids, Chlorella Vulgaris/Lupinus Albus Proteine Ferment, Pectin. I wasn't totally convinced by this brand as I thought it was only hype, but... I AM IN LOVE! First: the smell... I can't describe it but it's fresh and floral at once, reminds me of those fancy yet effective spa product. 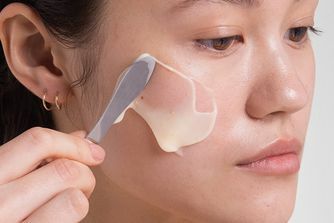 The texture is creamy, then foamy (of course) when you mix it with water, and a small amount is enough for the whole face so it'd last for a bit. I'll repurchase it for sure. I thoroughly enjoyed using this, I did try to re purchase but sadly out of stock when I needed it. has a really fresh, clean feel and suited my mature skin very well. I use as a second cleanse and it makes sure everything is removed thoroughly, it isn't dying and left my skin smooth. would use again if it was in stock. I wanted to purchase something from this brand as I’ve read lots of great reviews and tried many cleansers. I have combination skin and after reading the fab reviews thought I’d purchase. So glad I only bought the smaller size..:it does leave my skin feeling squeaky clean but it seems to have broken me out even after 3 weeks of using and have tried better for a cheaper price. Might be good for normal skin but not worth the money. I cannot say anything about the smell since my nose is not the best. My skin is mainly dry, with very few spots, some discolouration and freckles. I am not wowed by it. It does its job of cleaning, doesn't dry my skin, doesn't sting but that's about it. I have tested others that do the same but don't have the same money for marketing. Have used this cleanser every day for two weeks. I’m impressed! I use a tiny bit (maybe 2-3 cm) and it takes off literally all my make up (I wear light makeup). When I go through my face with a cotton pad after, there is nothing left. I have the big package and it will last me forever. A bit expensive. The only negative thing, it is a bit drying on my skin. But doesn’t matter as I continue with my nighttime skincare routine after. I purchased this off the back of reading Lydia Ellis Millen's wedding skincare in high hopes. The product smells like a treatment from the spa which isn't offensive but was strong for me and I then read it had perfume in the product - a no no for dry or sensitive skin. It's a beautiful blue colour and applies well to the skin with a very subtle foam once in contact with water. Avoid accidental contact with eyes, this really and truly stung! Regrettably it left my skin more dry than usual and felt tight and I've not see any improvement to the condition of my skin. Will not be repurchasing. For the price tag, I have other options I prefer. However this is a good cleaner, a bit drying for my combination skin in winter time, but good for summer. I have a combination skin and this cleanser is so far the best I have tried in my life. It will leave your skin soft and clean every morning and evening. I can't live without it now, I bring it everywhere. This is the most important product of my skincare routine. Best buy ever! I have combination, acne prone, extremely sensitive skin. I've tried so many cleansers from Clinique, Sunday Riley, Zelens, Ole Henriksen, Ren, Philosophy, First Aid Beauty, Origins etc. This is the one and only cleanser that doesn't irritate or break me out and cleanse my face properly without stripping out the oils of my skin. Cannot live without it. This is one of my favourite cleansers! The foam feels luxurious on the skin, removes make up and cleans effectively but doesn't leave your skin feeling dry or 'tight' afterwards. Also great value for money as a little goes a long way. I have sensitive, dry skin and this cleanser is the best I've ever tried. It's gentle but at the same time effective. The first foam cleanser, that doesn't dry my skin out. It doesn't brake me out too. I use it every day and have seen noticeable improvements in my skin in just a week. My skin is clean, refreshed, glowy and looks more polished afterwards. Plus the smell is amazing. I have sensitive combination skin (dryness in some areas but also an oily T-Zone). This cleanser works very good for me. My skin feels refreshed, smooth and clean. I feel like it really controls oily skin and helps prevent impurities! I have combination skin, acne prone, very sensitive one. This is the best cleanser that I’ve tried. It doesn’t dry my skin at all. I use this as a second step in my routine of cleansing, after cleansing oil, and there is no residue of makeup left. After washing my skin I don't have to hurry to moisturize my face, and that's very unusual for me. Smells great, too! Comes in a firm paste, makes it really easy to control just how much you want to squeeze out of the tube. Think a tube will last for months. Aside from the good value, I love how it’s foamy, and makes my face feel so fresh and clean. I've used this cleanser for a few years now. I generally dislike foam cleansers as I have fairly sensitive skin but this one isn't drying whatsoever. I like to use it in combination with my clarisonic. Oddly enough, it smells a little of fruit loops cereral which reminds me of my childhood. This is my favourite cleanser by far. You only need a small amount. It is light, but really effective. It removes all of my make-up and my face feels refreshed afterwards. Rinse with warm water, so easy. A must for your daily skincare routine. This product is divine. What's impressive is how little of an amount you need (seriously). Any more than half a pea and you're washing it off your hands and down the sink. The product emulsifies so perfectly, it's soft and silky texture covers my entire face and neck. I use Luna by Foreo following application and it's such a nice feeling. I'm normally not into either of those things because a) they're too faffy and b) too stripping. Together these two are great, it's easy, convenient and my face doesn't feel stripped at all. I just rinse it away with warm water and my face feels nourished and hydrated. Furthermore, for those that have made it this far, I also never use foaming cleansers and I really do love this one. Round of applause for Omorovicza ft. Foreo.